White House adviser says accusations of anti-Semitism are to prevent administration from being able to speak the truth and be pro-Israel. 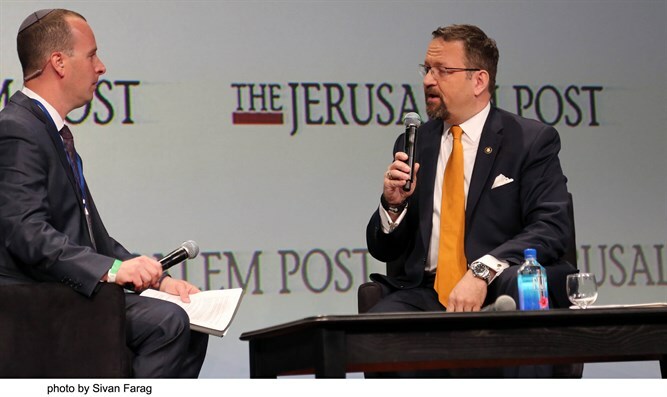 "I have spent my life fighting against totalitarian ideologies," Gorka said in response to the idea that he might have supported fascist groups. He said that his father "escorted his fellow Jewish schoolmates - who were forced to wear the star of David - to school every day and back, to stop the local German forces from assaulting them or spitting on them." He added that he was "proud" to wear the medal his father was given in 1979 "by anti-Communist members of a splinter order outside Hungary" as a symbol of the suffering endured by opponents of the Communist regime. Gorka was adamant that the organization which awarded the medal to his father was not anti-Semitic or extremist. "There are members of this order, like Vilmos Nagy, who was recognized in 1969 as a Righteous among the nations by Yad Vashem." He said that the campaign against his was based on nothing and was politically motivated. "Nobody, not one person, not at the Forward, not at Politico, not at any other place, has found one sentence that I have ever said over the last 46 years that is anti-Semitic or anti-Israel. You will find the opposite." "Because we are pro-Israel, we must be attacked. He quoted Vice President Mike Pence, who said last week: "We will always, unapologetically, stand by Israel," and called the relationship between the US and Israel "our closest relationship." He also called reports that he is being forced to leave the White House "very fake news." Gorka said that he viewed Islamic terrorist organizations as akin to fascist groups "because they are totalitarians."